What Oil Should I Use in My Transmission? What Fluid Should I Use in My Gearbox? Same question, asked two different ways. What fluid for your Nissan Skyline GT-R Gearbox. There are two main boxes, stock FS5R30A 5 speed, and the V160 Getrag 6 speeduses specific fluid 08885-01306 from Toyota, or we have used Redline High Temp ATF, and Royal Purple ATF. For a heavily loaded transmission like the FS5R30A, the ONLY fluid we recommend, after 18 years of working on Nissan Skyline GT-R, is Redline Shockproof Heavy Gearoil. 3rd gear sheared on a FS5R30A transmission. These are early and late transmission. An all wheel drive car puts loads into transmissions, that a rear wheel drive car will just never see. 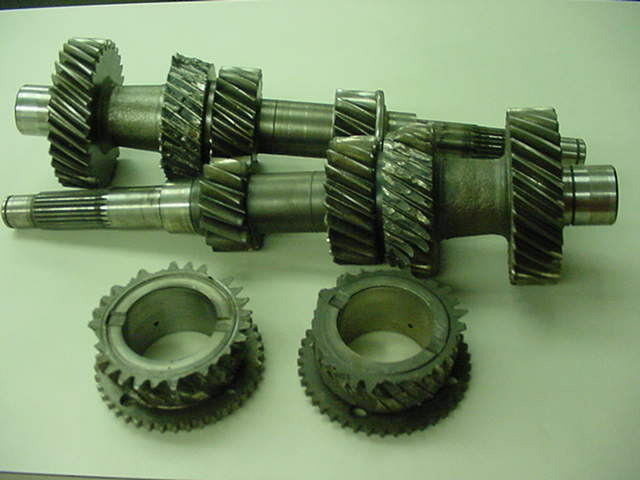 These gears are expected to transmit the power from the engine to the ground. In a rear wheel drive car you will always have some slippage, which is much less in an all wheel drive car. Redline does not recommend Shockproof Heavy in a synchro trans due to its extreme slipperiness. Here is a truth though. 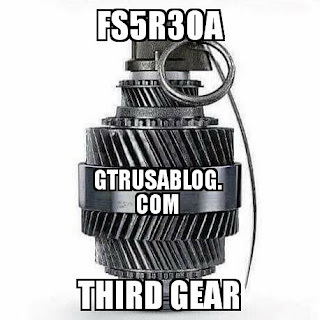 If you don't run it in a FS5R30A, your transmission gears (3rd gear) won't last long enough to care what happens to your synchros. About 90% of the people we talk to with synchro issues, once they put some Shockproof Heavy in the trans, the problems go away. While this may be masking the issue, the reality is again, the gears in the trans will not outlast the synchros when run hard. If you sit in a parking lot with the hood open, in a lawn chair, then run whatever fluid your "boy" recommends. However if you bang gears in a Nissan Skyline GT-R with any amount of power, Shockproof is the absolute best thing you can do to ensure a longer life for third gear. Fs5R30A Transmission in a Nissan Skyline GT-R. Third gear is the 2nd gear from the top. Notice the mismatch of the two gears. We first came across Redline Shockproof Heavy Gearoil after breaking two 3rd gears in a 500hp R32 GT-R in a week. While at Nissan North America, while they were still in Gardena, we spoke to Frank Honsowetz casually about our issue. He mentioned in the Nissan race trucks, they used to break transmissions all the time over the jumps. Once they put Shockproof Heavy in the transmissions their failure rate went way down. So we tried it. Once we started using it, our transmission failures decreased greatly. Not two in a week anymore. We still broke some transmissions, but the rate was much lower. Onto years later, racing a front wheel drive car. We would break a trans every couple months of "normal" track use. More often depending on who was driving. In that car, we swapped out to Shockproof Heavy, and in a year of SCCA Pro racing, only broke one transmission, in two cars, in a thirteen race season. While doing differential testing, the differential company asked us to use their fluid. First time out, we popped the transmission. Switched the fluid back to Shockproof Heavy, and no further failures. Any car that I run hard now, If I can use a gear oil in the transmission, the ONLY thing I will use is Shockproof. Any other fluid is setting myself up for failure. If I break it with Shockproof in it, then I need to have a look at those failures and fix them, before filling it up with Shockproof again. Nissan's recommendations on fluid types.